The Microsoft Lumia 435 is an odd little phone. Immediately recognisable as a Lumia, given its bold colours and polycarbonate body, yet boasting sharper lines, a more boxy design and a Microsoft logo, this is a different breed of Windows Phone. As the first 400-class device in the Lumia family, the Lumia 435 is designed to appeal to a different audience from its older siblings. It’s for those graduating from their first feature phone, those looking for a device to hand their child, or those seeking a back-up. Given the price point, this is clear to see. Available from under £60 ($95, around AU$12), and as low as £40 (around $62, AU$80) SIM-free and a mere £24.99 on PAYG in the UK, this is a low-risk investment. Given a year, Microsoft will likely be handing them out with Happy Meals. Yet, for this price, what do you get? Typically, buying a ‘good’ smartphone for less than £100 ($150, AU$200) has been a difficult proposition. With every increment, more features are dropped. The 435 is competing with the likes of the ZTE Kis 3 Max, Vodafone Smart 4 Mini and not really much else. Regardless, the spec sheet is reasonably beefy. The device touts a 4-inch 480 x 800 pixel screen (with 233ppi), a dual-core Snapdragon 200 processor clocked at 1.2 GHz, a healthy 1GB of RAM, HSDPA+ connectivity and 8GB of internal storage. For the price, this is quite decent. Despite this, for just a little bit more the new Moto E (2015) has a better, bigger screen, more battery life, a better processor and 4G. The same is true of the Honor Holly – better specs for a little more money. Both of these devices also have access to the superior Android app ecosystem. 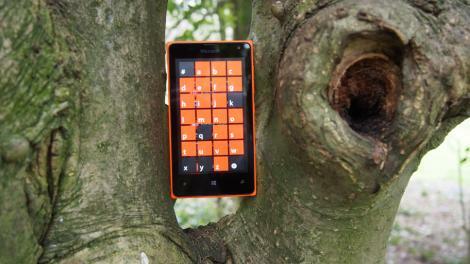 With such fierce competition, can the Lumia 435 successfully prove its worth? At first glance the Microsoft Lumia 435 has an unmistakable shape about it, almost unlike any other Lumia. I could see distinct design influences from Nokia’s ill-fated X-series of forked Android devices. After a long stare, however, it hits you: this is the successor to Nokia’s Asha line of advanced feature phones, with their odd, angular aesthetic – especially the Asha 503. Despite this unusual first impression, the Lumia certainly impresses. For the price, this device is solidly crafted. With a tiny 4-inch screen, the 435 sits comfortably in almost any hand. The sides hug the palm snugly, with no sharp edges to be found. At 134g, the phone is light but not insubstantial, and the even weight distribution ensures that it has a nice balance, making texting on the go a pleasant experience. With a removable back cover users have the option of a number of different colours; my unit came in a blindingly radioactive orange. The shell is constructed from a sturdy matte polycarbonate, meaning the 435 feels as though it can take hits in its stride. When the back is removed, the MicroSD slot can be accessed to add in some supplementary storage, while the MicroSIM holding mechanism is hidden under the 1560 mAh battery. The sides are relatively uncluttered in the normal Lumia style, with the power and volume keys all clustered on the right side of the phone, which is potentially something of a problem for left-handed users. All of the buttons have a nice click and are easy to tell apart, revealing some nice attention to detail. As usual the USB is hidden away on the bottom, while a 3.5mm headphone jack is placed on top. From the sides, the back rises in a gentle curve, much like the Lumia 930, with the contours easily hugging the palm. Sporting a single rear-firing speaker, the Microsoft branding and a fixed-focus 2MP camera, this is a mostly minimal affair. The screen is where the first obvious sacrifice has been made, as it lacks Gorilla Glass. It doesn’t have the distinct oleophobic coating that would otherwise allow it to shun fingerprints. Within minutes of using the Lumia 435, the screen hoarded my fingerprints as if they were going out of style; with regular use it will require the odd wipe. This phone isn’t going to win any style awards, nor will it be carried by Dolce & Gabbana any time soon. It is a comfortable utilitarian box, that’s completely unthreatening. As such, for the price and its intended audience, the Lumia 435 is something of a quiet triumph. The four-inch screen is standard for devices of this price class, and unfortunately it does not impress a great deal, even by such low standards. With 233ppi pixellation on small text is quite noticeable, meaning that reading web pages can be quite a difficult proposition. Outdoor lighting also presented a number of problems, and the milky blacks on offer meant that holding a WhatsApp conversation while on the go required the use of a second hand for shade. Despite this, auto brightness is available, something omitted from last year’s budget Lumia models. It isn’t the most sensitive, but its mere presence meant that I wasn’t constantly forced to manually adjust the screen lighting throughout the day, making things a little more convenient. As might be expected, viewing angles are poor. Colours fade away and light levels drop rapidly when viewed from odd angles, though overriding the auto-brightness can occasionally make things a little better. Back-lighting is also a little uneven, and this becomes very noticeable under certain lighting situations. Despite these issues, the screen is nice and sensitive; I had no problems with touch responsiveness. Though much improved from years ago, the Windows Phone app store still lags behind its rivals. Microsoft likes to trumpet the gains made in this area, and indeed progress has been quick. But Windows Phone still lacks the app ‘culture’ that draws in developers and ensures quality native apps, rather than poorly coded ports. When apps do arrive, they are often updated irregularly, and with the introduction of universal apps and Windows 10 Mobile later in the year, things are set to change again. Navigating through the Windows Phone store helps to compound the problem – despite typing ‘WordPress’ verbatim in an attempt to find that particular app, I was presented with a number of completely unrelated options, finding the app in question involved a mobile web search. Apps may come to Windows Phone when Microsoft’s grand vision of Windows 10 Mobile comes together, but, for the moment, the platform still struggles. Part of Windows Phone’s appeal as a mobile operating system has been the promise of easy, integrated connectivity with all of Microsoft’s software offerings. OneDrive has long been Microsoft’s answer to the likes of Dropbox and Google Drive, and bundled with the Office functionality baked into Windows Phone, this made working within my Microsoft ecosystem a very fluid experience. The OneDrive app itself has a very clean interface and is laid out sensibly. When camera upload is activated, images are launched into the cloud with a moment’s notice, with a minimum of waiting. Images uploaded to the camera roll folder do not count against the storage limit, meaning that keen shutterbugs can get quite a lot of mileage from this service. Working with Office, it was easy to create, edit, upload and share files on the go, including Powerpoint and Excel files. Though the appeal of this is admittedly niche, having the option was certainly pleasant and offered a tangible improvement to my daily routine. With the likes of Dropbox being the only real cloud-storage competitors in the Windows Phone space, it is easy to dismiss OneDrive, yet this is a real bonus for users. Owners of the Lumia 435 will receive 30GB of free OneDrive storage from Microsoft, making this potentially quite an attractive offer for some. Cortana, Microsoft’s little nod to Halo fans, is touted as a main selling point of Windows Phone. Is ‘she’ worth the attention? The answer is complicated. In daily use, Cortana makes for a pleasant comparison. Lacking the robotic sterility of Google Now and possessing a few more features than Siri, Cortana is certainly entertaining. Ask her for a joke and you will most likely laugh. However, her insistence on using Bing for search is unfortunately seemingly incurable. The app launches quickly, displaying relevant news for the day based on what interests you have selected. From there, you can type or speak a command or search request, after which you’ll be taken through the depths of Bing to lands (often) unknown. By selecting the hamburger menu on the top right, you are given access to various options in Cortana’s Notebook, where all of the information on you is stored. There, you can edit things such as interests, quiet hours and frequent places to personalise the experience of using Cortana. She also sports a reasonably accurate music recognition functionality, something which should occasionally come in useful when a catchy song comes on that you don’t know. By far the most useful feature is quiet hours, which allows you to specify times that you do not wish to be disturbed. As default, this will come on during meetings detailed in the calendar, but can also be triggered manually, making a good night’s sleep a little easier. Cortana is still in beta, and there are still a few growing pains (not least when trying to understand my Scottish burr) for her to get through. For the moment, however, it is a solid feature, though whether a voice assistant alone can sell phones is an unknown. Given the price point and the youthful demographic this device is aimed at, music playback is a major concern, and luckily the Lumia 435 does not disappoint. Though lacking the high-end Dolby audio options of other, more expensive, Lumia models, the 435 makes for a great little music player. With a good pair of in-ear headphones inserted, bass and treble were nicely layered and volume was excellent. As the speaker is rear-firing, it would be a reasonable assumption to make that audio reproduction would be poor. This is mostly true, but for the price it is difficult to beat. Definition is lost in higher treble and lower bass frequencies, but this speaker can really crank up the volume. If you like to host impromptu back-of-the-bus parties, the Lumia 435 is likely a phone for you. With a dual-core Snapdragon 200 processor clocked at 1.2 GHz, it would usually be a safe assumption that the Microsoft Lumia 435 would be something of a weakling. This is only half true. A fluid user experience has always been the hallmark of Windows Phones. From Windows Phone 7, which could easily have run on a waffle iron, the OS has been a lightweight, tight affair. With the introduction of Windows Phone 8.1, however, things have begun to change. For the most part, swiping through the OS on the Lumia 435 was snappy. Apps open and close without complaint. Coming from another operating system, especially from Android with developer animations removed, reveals the extent to which Windows Phone relies on these. Almost every action prompts a swoop or a fade, making for a pretty transition and masking the sometimes annoying loading times. Despite this, performance on day-to-day tasks was mostly solid, the average user, and indeed the target market for this device, will find very little to complain about. Gaming is a different matter, however. As might be expected, light titles such as Angry Birds and Jetpack Joyride ran easily and remained eminently playable. When moving to a more intensive class of titles, things began to change. Though Asphalt 8: Overdrive mostly achieved playable framerates, textures were quite jagged and loading the app took several minutes. Subway Surfers and Temple Run 2 also suffered, becoming unplayable as the processor struggled to handle the increase in pace as the games progressed in difficulty. Multitasking, not a strength of the platform to begin with, is also something of a chore. Apps are closed when not in use, meaning that navigating between a text conversation and the music app involves constant reloading. Having 1GB of RAM, this phone is being sold by Microsoft as upgradeable to Windows 10 later in the year, meaning that this device is more future-proof than most others in this price class. At 1560mAh the battery on the Lumia 435 is hardly the most substantial in the world. Yet, when coupled with the low-power dual-core CPU and the sub-HD screen, things are evened out a little. In everyday usage, the Lumia 435 fares quite well. Across a 16-hour day, checking and updating social media accounts, texting, listening to music on headphones for an hour and a half, watching a few YouTube videos, indulging in some light gaming, making around an hour of calls and browsing the internet on HSDPA+ for around half an hour, the battery lasted until the end with 12% spare. However, utilise the phone more sparingly and you are likely to see around two days of light usage, as Windows Phone standby times tend to be quite strong. As you might expect, the situation changes when it comes to more intensive tasks, such as heavy gaming or browsing the web while on the go. In these situations, the battery almost seems to drop in real-time, meaning that if you want an extended session of Asphalt you will have to fork out for a spare battery. Windows Phone does have a Battery Saver app included, and this does a reasonably efficient job of telling you what is eating battery life. If needed, there is a power-saver mode available, which (mercifully) does not throttle CPU performance but merely restricts background app usage even further. Activating this will typically see at least an extra hour of estimated battery life added, which is mostly backed up by real world usage. Road warriors will want to pump out for an extra battery, for although the Lumia is a solid performer, it is certainly of its price class. This isn’t a massive 3,000 mAh battery as is seen in many modern flagships such as the LG G4 however, as such expecting similar performance isn’t a realistic proposition. As is very important for most people who want to use their phone as a phone, the Lumia 435 is excellent for making calls. Call quality was rock solid, with voice reception clear on both ends, with very little distortion. The in-built microphone also did an excellent job of separating the noise of a busy street from my voice, something which I did not expect at this price point. The People Hub also remains one of the finer points of the Windows Phone OS and Microsoft has done a good job of building a ‘smart’ contacts list. In the hub, all contacts are pulled together in a neat little list, and in a nice twist information is pulled from social accounts, making the People Hub a great way to stay updated. Internet connectivity proved to be strong. HSDPA+ performance across the Bath and Bristol area on the O2 network proved to be strong, without any major hiccups. Being a country bumpkin, having no 4G proved not to be an issue, certainly not at this price point. Using the internet never proved to be an issue. Internet Explorer, Windows Phone’s native browser, proved to be a fairly swift guide through the darkness of the net, however Flash heavy-sites did cause some stuttering. Pages mostly loaded quickly, and I had no major complaints regarding the Lumia 435’s performance in this area. The Windows Phone in-built email client also proved to be quite useful. As a native offering, it is relatively feature-rich, pulling three email accounts into one inbox proved to be a very easy process and it worked fluidly throughout the review process. As for text editing, the Windows Phone keyboard remains an excellent option. Though the platform doesn’t have the ability to select from a host of different option, the keys are well spaced, the feedback is nice, gesture typing works well and auto-correction is mostly faultless. Finding a better option elsewhere is certainly possible, but when compared to the default keyboards of certain Android OEMs, the Windows Phone offering is solid. GPS performance was adequate, achieving a lock within a reasonable time frame. The last, and biggest sacrifice to cost, asides from the processor and the screen, comes in the form of the rear-facing camera of the Lumia 435. It is a 2MP fixed-focus effort, seemingly transported straight from a candy-bar phone in 2005. Needless to say, images are not excellent. Even in bright lighting, with good visibility, the images produced by this tiny sensor are very soft, with little fine detail. As might be expected, when viewed on the smaller screen of the phone, this is less apparent; when blown up, it is a completely different story. Given the fixed focus of the lens, shots are often very blurry and must be aligned correctly for acceptable results. As might be expected at this price, there is no flash. For such a cheap phone, this is hardly surprising. Yet as 5MP auto-focus efforts are slowly working their way down the pecking order into more and more budget handsets, it is unusual to see such a poor snapper, especially in a range which is known for its camera performance. However, very unusually for such a budget device, a front-facing camera has been included. In addition to allowing for the ever-important selfie, this facilitates video-calls. With a VGA resolution, however, Skype calls eventually begin to resemble conversation through cataracts. This is a good effort for the price, yet remains essentially unusable. Those looking for a better selfie cam are best advised to look at the Lumia 535, which has a nice wide-angle 5mp front-facing sensor for only £30 more. Video from the rear-camera was similarly poor, with footage being very shaky, though recorded audio was surprisingly decent. Footage can either be recorded in FWVGA or VGA resolution. The story of the Microsoft Lumia 435 is one of sacrifice. Coming in with a sub-par screen, a small battery and poor camera, this phone isn’t going to please the high-end crowd. Yet at roughly a 10th of the cost of a new iPhone 6, Samsung Galaxy S6 or LG G4, competing at such a level is not a priority for the Lumia 435. As more budget devices arrive touting 4G, Quad Core processors and 720p screens, it is difficult to tell if the Lumia 435 will continue to have a place in the mobile phone market. The build quality of this device, for the price level, is excellent. The unit feels very solid and could most likely survive the extended attention of a clumsy child. With no flex or give, and the ability to buy new back-plates, this would make a great companion for the accident-prone. Despite the device’s lower-end specs, using the Windows Phone OS was a fluid and enjoyable affair. Juggling various email accounts with texting and instant messaging proved to be a good experience overall, with the battery lasting through a busy day of communicating. Music playback proved to be something of a treat. As an MP3 player, this device is a strong pick, especially with the option to add more storage via MicroSD. The speakers reach satisfyingly loud volume levels, making rocking out all the easier. Gaming performance, as a whole, is under par. Subway Surfers, which has been optimised for budget devices, becomes unplayable in its later stages, when faster reaction times are required, as the processor simply can’t keep up. The screen is very difficult to view in sunlight, often whether it is bright or not. This is made worse by the auto-brightness sensor, which is confused very easily. Viewing angles are also poor, and reading text can become a little difficult on certain webpages. Apps on the Windows Phone store remain sparse. What options are available are rarely updated, navigating the store remains a chore, and with universal apps on the way later in the year, it is yet to be seen how many developers will choose to port their apps over. The Microsoft Lumia 435 is a funny little phone. With its eye-catching looks and a sturdy, comfortable design, it makes a great first impression. In day-to-day use, this mostly remains. Navigating the OS is a relatively painless affair and listening to music is something of a treat. The fact that this phone will receive Windows 10 also makes it a tantalising offer for those who want to try something a little different later in the year without breaking the bank. Yet with a poor screen, bad cameras and laggy performance in many tasks, this is a device that has many drawbacks. What it all boils down to, however, is price. The Lumia 520 became the most popular Windows Phone handset not because of its obvious superiority or wonderful good looks, but because of its price. By the end of its shelf life, Microsoft was practically giving them away. This is where the 435 is intended to sit, and as a phone meant to be sold in shovels, it is well worth a look.